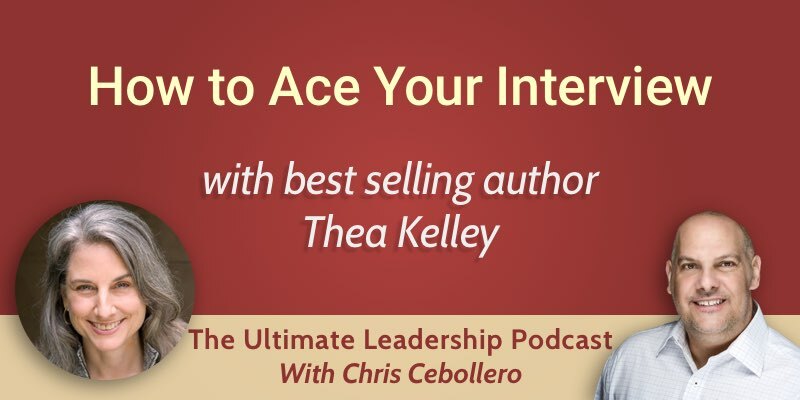 On this episode of The Ultimate Leadership Podcast, career coach and bestselling author Thea Kelley shares her expertise on how to build a proactive strategy prior to your interview to finally get that job. Why is interviewing so terrifying? It’s very natural to be nervous about an interview. A lot of it is about fear of the unknown, a lack of control. You don’t know what to expect. You should take control by having a proactive interview strategy. This is where leaders have an advantage because they are used to strategic planning. The company may be interviewing an average of five candidates, all of whom are qualified. Your task is not just to show that you’re qualified, but to stand out. To make yourself memorable as the best candidate. It’s not a matter of magic, it’s a matter of having a proactive strategy. Most candidates will go to an interview without an overall strategy. Strategy has to be complemented with authenticity. Strategic planning has a lot to do with strengths and weaknesses. You need to make an effort to identify what makes you stand out. What are your key selling points? What do I do better than most? What skills do I have that are hard to find? What’s my most impressive accomplishment in the last 5 years? Is there anything impressive about my career trajectory? What would my clients or managers say it makes me especially valuable? The best key selling points to emphasize in an interview or on a resume need to be REV: Relevant, Exceptional and Verifiable. The first interview question is important. You can answer it with an introduction that focuses on your key selling points. Right off the bat, you’re hitting the interviewers with a few memorable points about you. You should use stories and examples from your work that illustrate your top selling points. People tend to remember what they heard first and what they hear last. So you should end your interview by bringing your key selling points up again. Authenticity starts with telling the truth but goes beyond that. You can tell the truth and still come across as not being authentic. One of the things that makes people sound inauthentic during an interview is reciting. It appears that they don’t have faith in their communication abilities enough to say it in a natural way. If you’re reciting something you’ve memorized, you are not as believable. Being conversational is part of being authentic. Painting a picture with stories and examples also makes you more authentic.